Musee L’Orangerie is perhaps most famous for being the site of Impressionist artist, Claude Monet’s, Nympheas, or Waterlilies. L’Orangerie isn’t the most impressive building in the world, which is a bit of a surprise given its city centre location. However, what it lacks on the outside, it more than makes up for on the inside. The upper gallery of L’Orangerie is entirely dedicated to Monet’s Waterlilies panels. I’ve been so used to seeing square shaped replicas, I was quite taken aback by their scale. In actual fact, the original works are massive panels. This rather took me by surprise when I first spotted them. 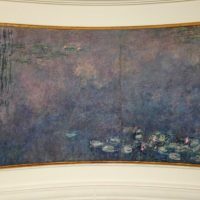 The pieces stretch out across the walls and are in dimensions that must have been a challenge to produce, never mind actually paint to the standard Monet did. The gallery is light and airy and, as it was designed specifically to house the Waterlilies collection, they fit the area perfectly. On the lower floor of the museum is an exhibition of works collected by Paul Guilliame and his wife, Dominica. All of the art on show is from their private collection and it was truly jaw-dropping. The entire collection is incredible, but I couldn’t help thinking the couple’s home contents insurance premiums must’ve been astronomical. Imagine the panic of arriving at work in the morning and having that nagging doubt about whether you’d locked the front door? How stressful. If you love Renoir, Cezanne, Picasso, Matisse, Rodin, and Derain, you’ll be in heaven. There’s also a single work by Monet, which perfectly complements the Waterlilies on the floor above. L’Orangerie is a bright and beautiful space. The vibrant colours and artistic talent on show mean it’s impossible not to dart around in a somewhat manic fashion. That’s what I did, anyway. Do pick your jaw up off the floor, though because no one wants you slobbering on their priceless artworks. The museum is open all year round and an adult ticket will set you back a very reasonable EU9. What’s your favourite piece in Musee L’Orangerie?